As you know Biology is all fun if you know how to play it. I played it really well in 9th Class when I got 74/75 in FBISE. My formula was simple clear your concepts and diagrams, get the unexpected marks. The topics that were difficult for me, I made use of Google and Youtube to see the animation. On the exam day, I just wrote a few lines and a diagram to the answer of each question. Even I knew 1% about a thing, I applied for the same role. Due to this reason, I had been getting great marks in SSC and HSSC in Biology. These notes have 9 chapters, every chapter is well explained with short questions and long questions. You don't need a guide if you get these notes. These are far better than having a guide. In this first chapter, the basic of Biology is explained with short and long questions. All the definition of the Biology branches that give you the basic understanding of the future jobs that you can get. Then the most important question, "What are bio elements? ", and its answer is depicted in the notes. Then another critical topic level of organizations is often asked in the exams. This chapter creates so much confusion among the 9th class students because students think there is no important question. But it has 2 important long questions which are amazingly explained in the notes. One is about the biological methods and steps which are involved in it to solve a problem. The second important question is the biological methods with an example of malaria. This chapter all deals with biodiversity. In simple words, it is all about the kinds of creatures exist all over the world. Either it comes to plants or animal. Then it is explained how 5 kingdom system of classification came into play. And why scientist didn't like the 2 and 3 kingdom system of classification. In your book, you will find many difficult definitions that would be difficult to memorize, but the notes are written in easy words. It runs from the reproduction, then its levels. Cell Cycle is explained really well. Here is also a video on Mitosis on Youtube. If you click on CC, you will see the subtitle for Urdu and English - you have to select from the 'Option' first. It's the easiest and the shortest chapter of 9th Class Biology. It is easy to understand, only a few terms have difficult definitions which are important to the exams. These terms are cofactors, prosthetic groups, and co-enzymes. Then the most important long question is 'factors that affect the rate of enzyme action. As the name suggests, it is all about how a cell deals with energy. How it is formed, and broken down to run the cell activities. Then the role of ATP is discussed. The most important question is 'the mechanism of photosynthesis: light and dark reactions.' The dark reaction is considered the best question because it is somewhat complex and needs concepts and a diagram. This chapter is all about food - how it is obtained, prepared, converted into body substances for growth and energy. That's why it is called nutrition. Then types of organics, micronutrient, and macronutrients are discussed. You might be curious that is it about transportation how a car goes from city to another? How fast an airplane flies. Why the bullet train of Japan is faster than the Pakistani train? No! It is about the cell. How materials are transported from one cell to another. How it happens in plants, and human beings. The most important question is of heart, what is its structure and how it works. Just memorize the diagram, and learn 8 important sentences on which you make a short heading. You can get the good marks. Keep a good eye on the diagram. 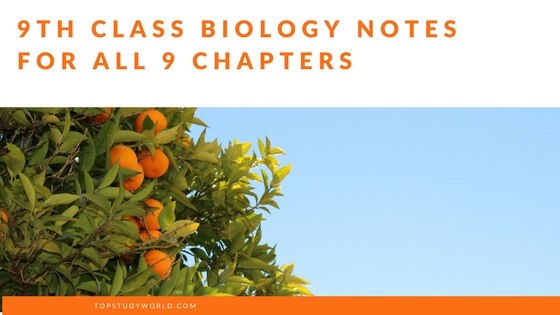 A lot of Pakistani students are looking for 9th Class Biology Notes for Federal Board on the internet, here I made their lives easy ed the notes in PDF as well as they can read online without downloading anything.